Bac Ha is the town of Lao Cai where is located in North – East of Lao Cai city. The distance from Hanoi to Bac Ha is about 318 km which takes you about 8 hours riding with amazing moutain view on it's way. - Visit a lot of highlights in Bac Ha such as: Bac Ha market, Coc ly market, Hoang A Tuong place and Lung Phinh cave which are attracttive all travellers on the world. - Taking only transportation to Bac Ha is a good way for you to do those things by yourself with more freedom. 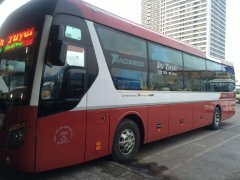 We offer 1 ways bus which is everyday departure. 17.00: Our guide and car pick you up at the hotel in the Hanoi Old Quarter then takes 40 minutes to My Dinh bus station. 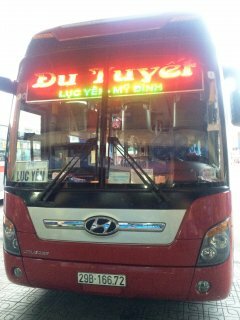 17.40: At My Dinh bus station, get on sleeping bus to Lao Cai province, Bac Ha market. On the way we have 1 time for break. 4.00: Arrive at Bac Ha town (last stop). Included: English speaking guide, taxi to My Dinh bus station, bus ticket to Bac Ha. Hanoi Oldquarter – My Dinh bus staion – Vinh phuc province – Phu Tho province – KM57 (shortbreak) - Lao Cai city – Bac Ha town (last stop). 20.00: Our driver will pick you up from Bac Ha bus station in the centre of Bac Ha town. We will give you phone number and bus plate number when you book the ticket. It take 8 hours to Hanoi. On the way we have short break. 5.00: Arrive at My Dinh bus station in Hanoi (last stop). Included: Bus ticket to Hanoi. 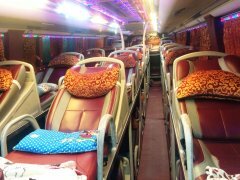 Bac Ha bus station – Lao Cai city – KM 57 (shortbreak) – Phu Tho province – Vinh phuc province – My dinh Bus station. You can rent motorbike in any travel agencies in Hanoi to slowly driving to Lao Cai city then Bac Ha and back . For a good quality for mountain roads motorbike, it costs about 10 USD per day which can be for 2 people sit on. You should drive slowly to enjoy landscapes and stop for photos shooting on the way. Therefore you should have a stop overnight somewhere on your way. !!! Warning: You should be carefully before renting because roads to Lao Cai are very dangerous with high passes, uphills way, specially in the dense fog. You can book and join a tourist bus from companies who organise tours to Bac Ha but it really depends. Because tour from Hanoi to Bac Ha only departure on a fixed day in week. Therefore, sometimes you can book - sometimes you can not. And it can be cancelled in a short advance when they cant collect enough customers to make their tour run. You can go to Bac Ha market everyday, but the best time is during weekends as the market is only taken place during Saturday night and Sunday morning.